Over the past few years I've slowly gravitated away from zero drop running shoes for no apparent reason other than my Merrell Trail Gloves and Vibram Fivefingers wore out and gave way to a 3mm (ish) drop of Icebug Acceleritas as most of my trail running here in the desert involves lots of sharp rocks. Frankly, I just didn't get around to picking up any new models even though there was a glaring hole in my shoe rotation. I've covered my regimen of rotating shoe brands and styles for training quite a bit in earlier posts. To recap: I believe running form and mechanics benefit from training in different styles of shoes (and barefoot) and rotating your footwear each session. You'll be constantly changing your strike point, angulation, pro/supination, toe off, stride, etc. each session while not relying on one specific type of support or cushioning “crutch” to overly influence any of these factors. Basically, become a stronger runner by working on your weaknesses. Note: Switching takes patience, don't overdo distance or pace with a dramatically different shoe or barefoot. 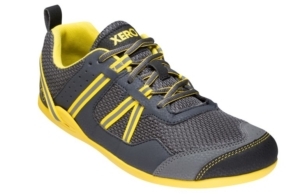 A conversation with the author of Beating Morton's Neuroma sparked from noticing his Evo shoes and led me online for top-rated minimal shoes, and boom – Xero Shoes! A quick email to the founder & CEO and a few test pairs were on the way, Prio and Cloud for me, and Terraflex to Evan (review to come). I took the advice on Xeroshoes.com (the gray box on the right in the image below) and ordered a pair of Prio 1/2 size up, and actually found them a bit long in the toe to go along with the roomy toebox, so purchased a pair at my “normal” size of 9.5 and kept the size 10 ones for kicking around with a pair of Icebug's dual arch insoles. Even though I ran in zero drop/minimalist shoes for many years, after a couple ankle injuries (OCR) and MCL/meniscus tears in both knees (soccer) my form has changed considerably, and I needed a few runs of 3 miles or less to adapt my mechanics back to a forefoot strike. The first run you could hear me from a mile away flap-flap-flapping along on the pavement with a very flat midfoot strike. The Xero Prio does not have any midfoot rocker, until I got my footstrike forward it was a jarring experience. 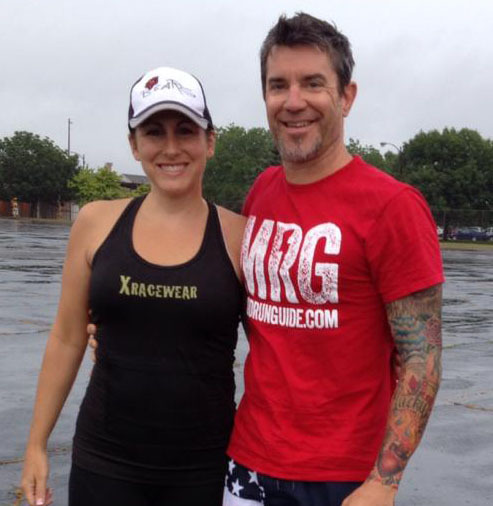 Note: I recommend running on grass or soft trails while getting used to zero drop minimal shoes. The second pair Xero Shoes Prio arrived a few hours before we flew out to Florida and then on to compete in the Bermuda Triple Challenge, so I did what any logical person would do; I decided Xero Shoes were the only ones I'd bring on vacation for 10 days to get a really good test of the Prio and Cloud models from airport to beach and even cliff-jumping. 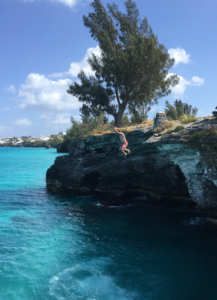 Note: The Cloud sandals float, I was happy to learn that when I lost one after a 30′ plunge into the water. Walking around in shoes as flexible as the Prio is superbly comfortable to me, they feel like high-tech slippers with plenty of traction. I chose to use the size 10 models for all-around wear from airports to such and swapped into the Cloud sandals whenever I didn't need any toe coverage. Over the course of 10 days on the road, both saw plenty of wear. The Clouds are so simple to slide my foot in and adjust properly, I know they will get a ton of year-round use in AZ. The Prio toebox is roomy; while I wouldn't consider it excessively wide, it does provide plenty of extra space for my average width feet. With the addition of insoles, the 1/2 size larger pair doesn't feel floppy, yet the 9.5 model fits perfectly with a thicker pair of Mudgear trail socks. Even in smaller (my traditional size 9.5) pair, my toes did not rub at all, nor did I feel any lateral tightness or chafing through the first fifteen miles of usage in some rather extreme terrain. Let me remind you that the Prio is a road/fitness shoe, yet the chevron-treaded sole gave me the confidence they would have enough traction for road, trail, ocean, and mountain wear. 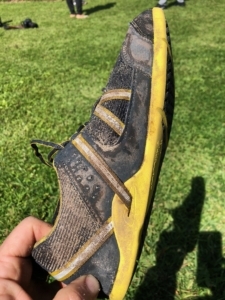 While Xero Shoes do make an off-road shoe, Terraflex, I pegged the traction and durability of the Prio right between similar models from Merrell; Trail Glove and Vapor Glove, and assumed the Prio could handle the varying terrain I'd be testing them on. Bermuda Triple Challenge consists of 3 races over 3 days, on Friday I pulled the insoles out of the size 9.5 models and tightened 'em down as well as I could for the first test, a 2 mile run through the streets of St. George Island for the Argus Urban Foot Race. The entire race took place on pavement, and the Prio performed perfectly, quite frankly after I laced them up I didn't think about them again until I removed them at the hotel that night. The traction on the pavement and over obstacles was more than adequate and the fit was comfortable. I knew Saturday would be the real test, nearly 8 miles of running on the beach, trails, and even in the water during the Sun Life Island Challenge. Once again, the Prios were up to the test, delivering plenty of traction over all the varying terrain and obstacles. The sole provided just enough protection for varying conditions underfoot while still allowing for plenty of groundfeel. The reinforced instep did an adequate job of safeguarding my arch from the occasional rock and the flexible sole gripped well on rocks and man-made obstacles. 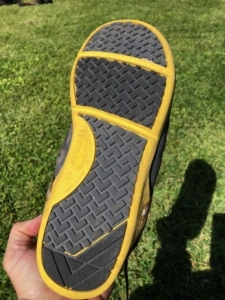 During the beach runs the wider toebox seemed to work well to keep me on top of the sand, similar to deflating your Jeep tires to achieve maximum surface area and stay atop of loose dirt. I was also very surprised that they didn't seem to let in any of the powdery fine sand Bermuda is famous for, and I didn't have anything to empty out after the race. While running through water, they performed well and ejected the water quickly when I exited. Once again, the Xero Shoes Prio performed well in these varying conditions. The final event of BTC is a 5k run through the Royal Naval Dockyards for the Chubb Royal Challenge, most of the running is on pavement and the race features 5 swimming sections as well. Like Friday & Saturday, the Sunday event was no sweat for the Prio as far as fit & traction, and I found they were really quite effective to swim in, the rubber sole feels rather buoyant. After all three events I walked away with the content feeling that the Prio is capable of nearly anything aside from muddy conditions or really loose rocks. I tested the latter out when I returned to AZ. Let me reiterate: The Prio is not Xero's aggressive trail shoe, for gnarly conditions you should choose the Terraflex… right? 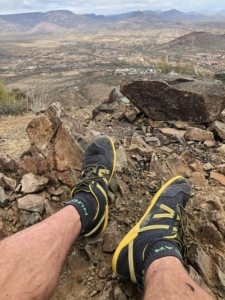 Well, I took the Prio out and pushed 'em to their limits on a 10k round trip to the top of Daisy Mountain Peak, a 2900′ climb over some very sharp, rocky terrain and found that even though they weren't the ideal shoe for the descents, they performed admirably during the flat sections and ascents. The occasionally misplaced footfall on a sharp rock did yield a little unpleasant feedback, but the soles did a very solid job of protecting my feet. By comparison, I can't run these same trails in the Reebok All Terrain Super 2.0 without beating my feet up pretty badly. During the descents I had to pick my path very carefully, with a higher-traction shoe (like the Terraflex) I could be a little more aggressive knowing I had extra traction if the loose rockfall gave away. Overall, they performed well in extreme conditions that they were not designed for, while still feeling good on the 1 mile run to & from the trails back home. The Xero Shoes Prio is a very solid road & fitness shoe that can be used for nearly any conditions and makes a great lightweight road racer or even daily walk-around shoe. At $89, they are priced very comparable with similar offerings from Merrell, and fit the niche nicely between Trail Glove and Vapor Glove. I really like the integrated eyelet straps that allow you to lock down heel and forefoot separately if you so choose.